Happy Monday! I love this cardigan but after wearing it in black last week I realized how wide the sleeves are by sizing up. 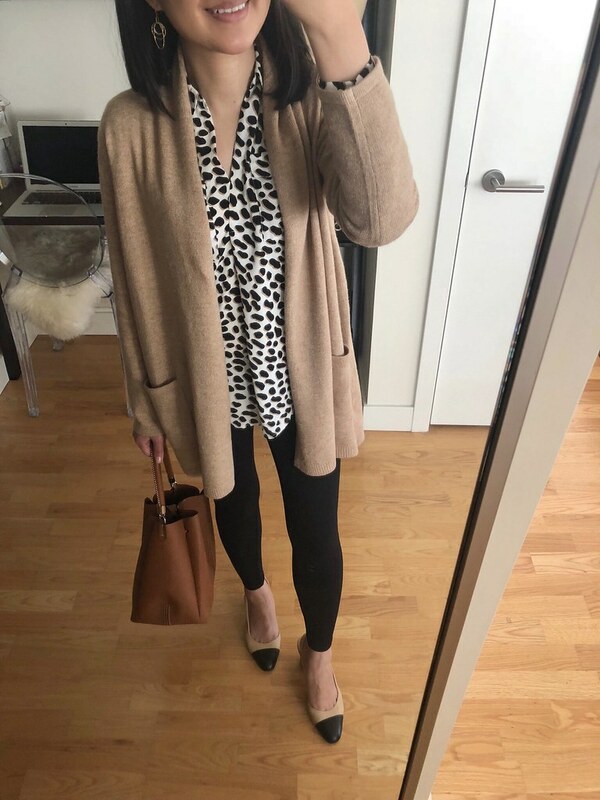 I may try to grab these cardigans again in my usual size XSP instead (or perhaps even sizing down to size XXSP) and give size SP to my sister who is 5’7″. These ponte pants (review and measurements here) are really comfy leggings and I wore them twice last week. 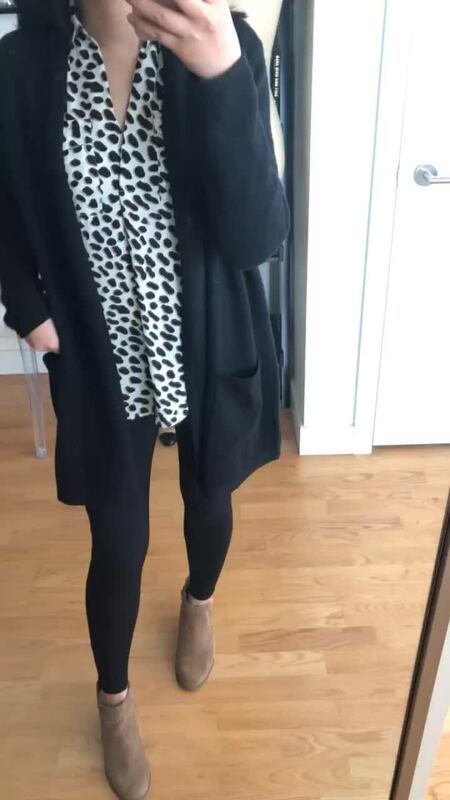 I paired it with this leopard print blouse for the first outfit as seen on me below and my new cap toe heels. 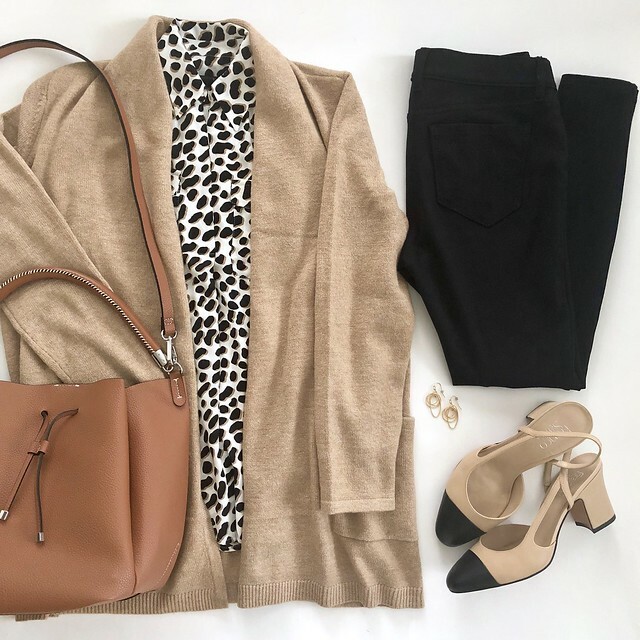 This neutral pairing is perfect for fall so I swapped out the cap toe pumps for neutral booties and I even tried it with the black version of the same cardigan as seen below. I was on the fence about these booties during the #nsale but I love how comfortable they are since I decided to keep them after all. 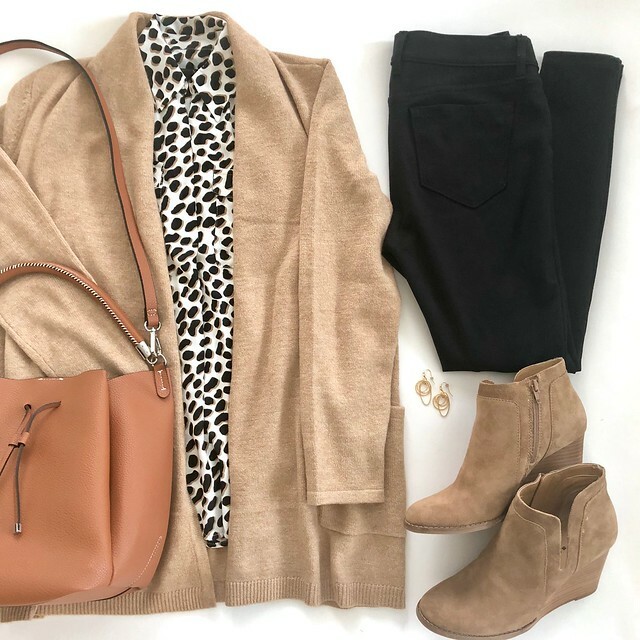 Here is another clip of this outfit paired with neutral booties. 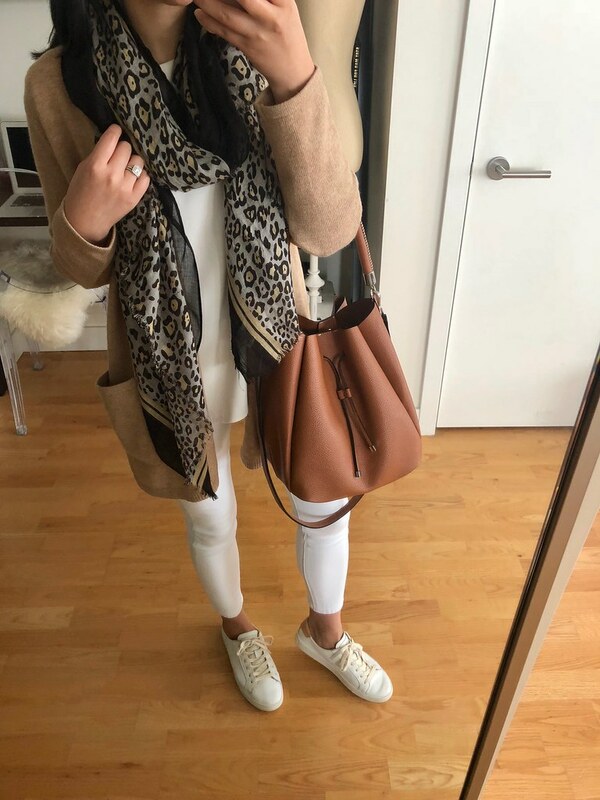 This leopard print scarf is one of my favorite past season purchases*. 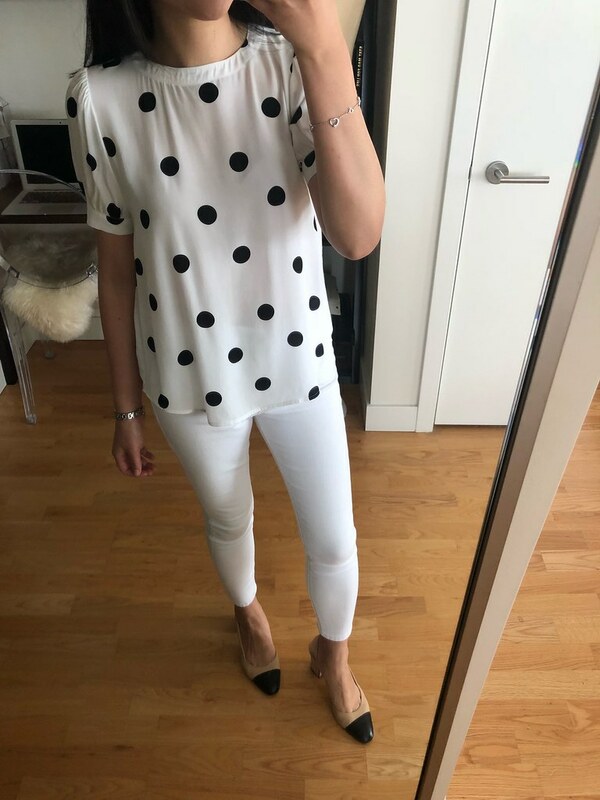 I finally managed to snag size XXS regular in the whisper white square neck blouse that was on my wish list. Note: If your item is very old the stock image may no longer be online. If your item was offered in multiple colors it may display a different color than the item you want to sell. I took in my usual size XXS regular in this blush pink swingy sweater and this striped swingy sweater (review of size XS regular here). It fits true to size for a relaxed fit. The solid pink color is 1″ longer (26″) than the striped sweater (25″) even though they are the same exact size. The next day I steamed out both sweaters (I haven’t washed them yet) and they each became one inch longer since the steam does make the fabric stretch. The pink one is still 1″ longer than the striped one. As a few of the online reviews noted the sleeves of this sweater are slightly shorter. I wore the striped sweater yesterday not realizing how warm it was outside but I was too lazy to head back home to change. Now that it’s fall I was in full fall dressing mode. 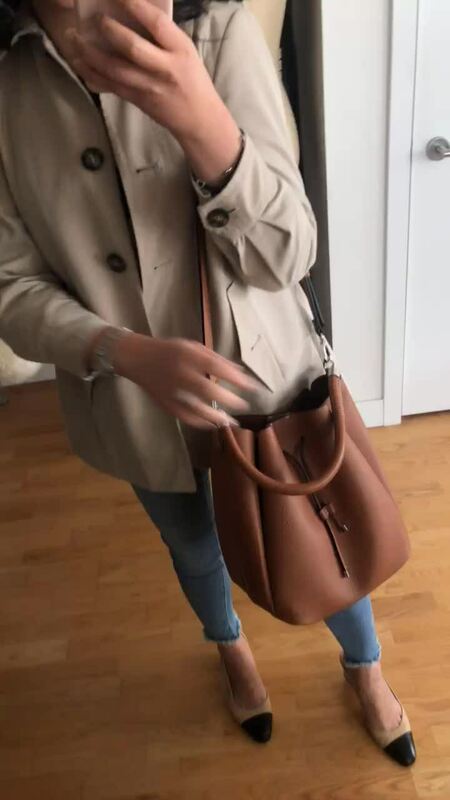 I’ve been looking for a cognac bag and I was excited to find this bag for $39.90 at Zara. It’s lightweight, roomy and well made and the white stitching on the handle reminds me of a baseball glove. The crossbody strap was originally 42″ at the shortest length. I used a leather hole puncher to add an additional hole which made it 41″ for a 20.5″ drop length which is still long on me since I’m only 5′ 2.5″ but I’ll take the small improvement. It only has one flap pocket on the inside of the bag so I am using a small bag organizer inside to keep my things organized. Here is the polkadot top before I went to work and then here is the top after I got out of the car on the way to work. 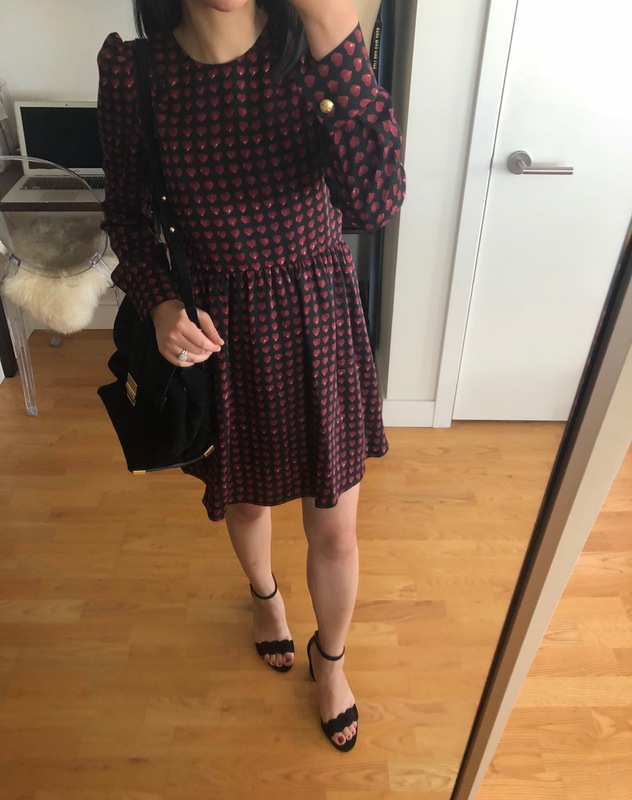 I was excited to get this top since I had missed it in my initial perusal of the previous set of new fall arrivals but the viscose material terribly so badly that I regret keeping it. I have yet to wash it but I will try to report back on how well it fares once it touches water. Size XXSP fits like size XSP if you caught a glimpse of it over on my Instagram stories last week. I received size XXSP for this sweatshirt (review of size XSP here) and the shoulders (13″), bust (32.5″ measured pit to pit) and sleeves are too snug for comfort so it’s going back. Sadly I’m somewhere between size XXSP and XSP so there is no happy medium for me for the sizing on this top. 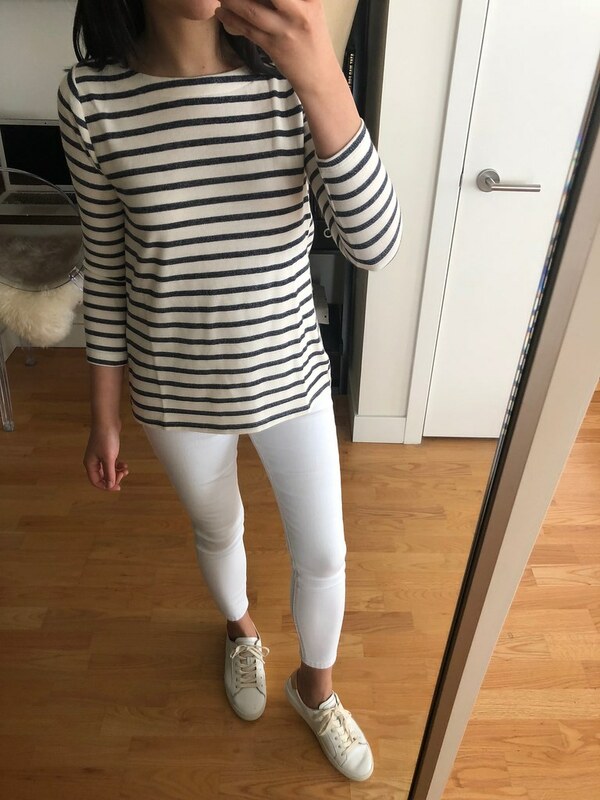 I loved these white jeans in the 36W x 28L petite length (review and measurements here) and they’re on sale for $35. 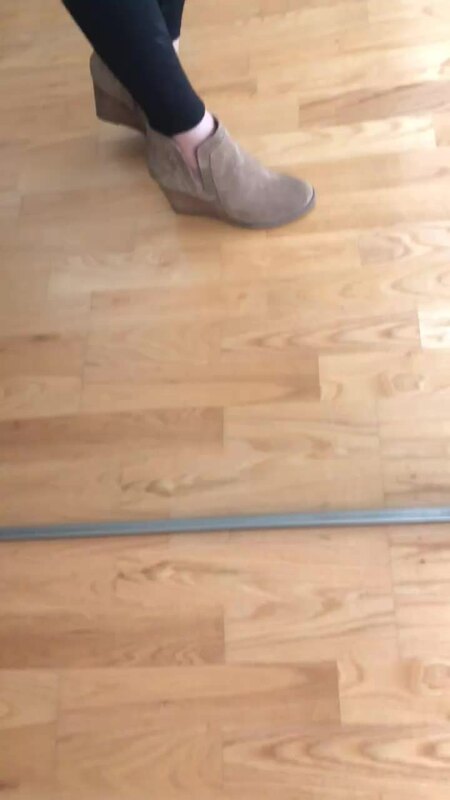 I ordered size 26W X 30L to try which fit me well although the both the rise and the inseam combination makes this size slightly longer than I prefer so I think it looks best cuffed. The measurements of size 26W x 30L are as follows: 10″ rise, 26″ waist, 26.5″ inseam, 9″ ankle opening. 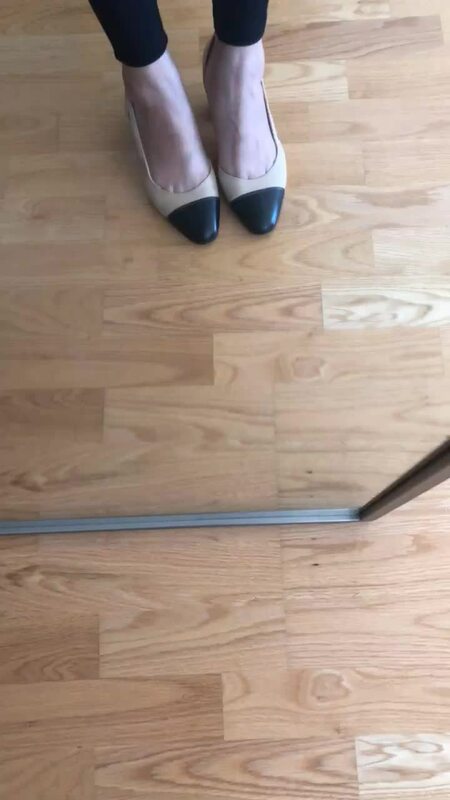 I saw these cap toe heels on @annawpage and I ordered these to try in size 7 and 7.5 since I was unsure about the sizing. I found they they fit true to size so I took my usual size 7. The slingback strap may be slightly looser but once my feet swell from walking they were comfortable and I like that the strap don’t dig in to my ankles but they do stay put. The first day I wore them for a 1.5 mile walk in the city and I got blisters on my big toe since I didn’t bother to break them in at home. I rubbed a drop of lavender essential oil onto the blisters at night which helped them heal faster. I wore the shoes again yesterday and I was prepared to get blisters from walking around for a few hours since I didn’t bring band aids but my blisters are fully healed (after a few days of applying lavender essential oil at night) and I didn’t get any new blisters. This was my first time treating blisters with lavender essential oil but it healed and returned my skin to normal compared to when I leave blisters to dry and peel off on their own. It’s like the blister wasn’t even there including the blisters on the back of my heels that I got from the J.Crew d’orsay flats that I reviewed here. You can read more about lavender essential oil for blisters in this post from another blogger. I had the same experience that she describes in more detail. I was curious about this blouse since I thought the ruffles and half sleeves were adorable but the one I received had sewing imperfections as mentioned in the video clips I linked. The top is also 100% viscose which for me is hard to justify the almost $50 price tag. The top has short, boxy fit which makes it petite friendly. 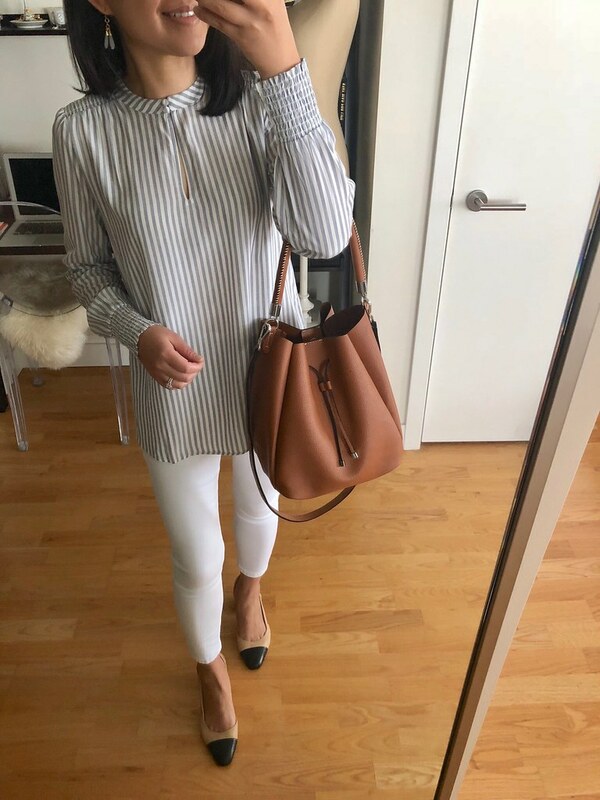 I personally prefer this side twist blouse (review here) more so I’ll return this top from Zara. Size XS is 40″ at the chest (measured pit to pit) and 23″ total length. 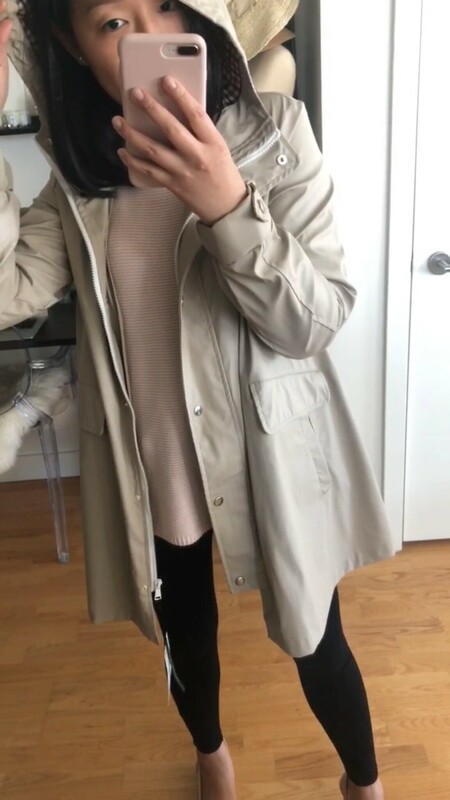 I like the plaid lining on this raincoat but since it is very thin I am still trying to decide if I should keep it since it is a very oversized fit on me in size XS. I have longer arms than most petites so the 24″ sleeves fit me well. It’s $69.90 and best for spring and summer but it’s oversized enough that it would also work over fall layers. Size XS has 15.25″ shoulders, 40″ at the chest (measured pit to pit) and 32.5″ total length. It’s made of a water repellent material and it didn’t arrive with any bad smells. Update 10/17: The hood doesn’t stay on well if it’s windy since there is nothing to cinch it tighter to stay on your head. 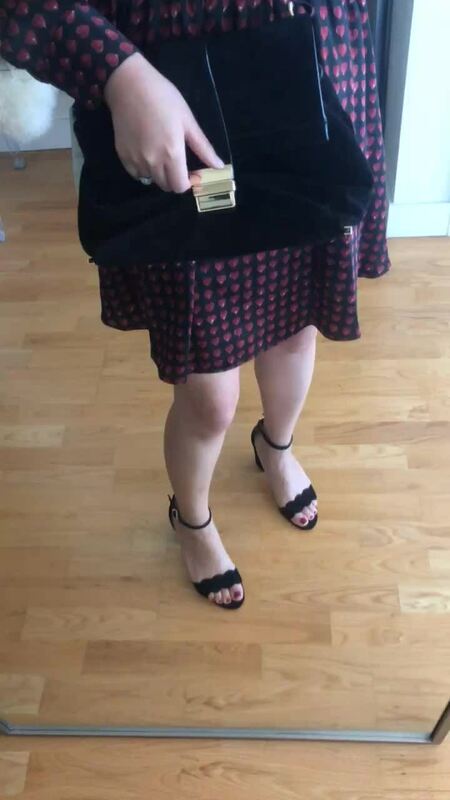 This heart print dress had caught my eye in store a few weeks ago but size XS was sold out so I ordered it online to try. Unfortunately size XS is very oversized and the measurements are as follows: 35″ chest, 30″ waist, 24″ sleeve length, 33.5″ total length. The dress is fully lined and well made. The inner lining in the skirt portion of the dress fits like a skort (skirt + shorts). I liked the idea of this medium sized suede bag when I saw it online so I ordered it to try. Unfortunately the one I was sent looked very old and beat up so I’m not sure if I was sent a returned one but I wasn’t pleased with how slouchy and worn the material looks in person. The drop shoulders on this tee are an awkward fit on me but I love the stripes and modest v-neck. The tee is very short especially with the V shaped cutouts on the sides. I haven’t tried on Banana Republic jeans in a long time but these jeans are very on trend without too much distressing and only one knee has been busted open. Size 25P fit me well and the petites inseam is also on point which is very rare to find for step hem jeans. I am waiting for their next sale starting on October 11-15 to get an extra 20% off (use code BRCARD20) and free shipping (BRCARDFS) to place an order. Hopefully the offer will stack with a decent sale. The online stock image for these jeans are so misleading since these jeans are actually very figure flattering. Update 10/18: Size 25P measurements are as follows: 7.5″ rise, 27″ waist, 32.5″ hips, 25.25″ inseam, 9″ ankle opening. The stretchy material is 90% cotton, 7% polyester and 3% spandex. 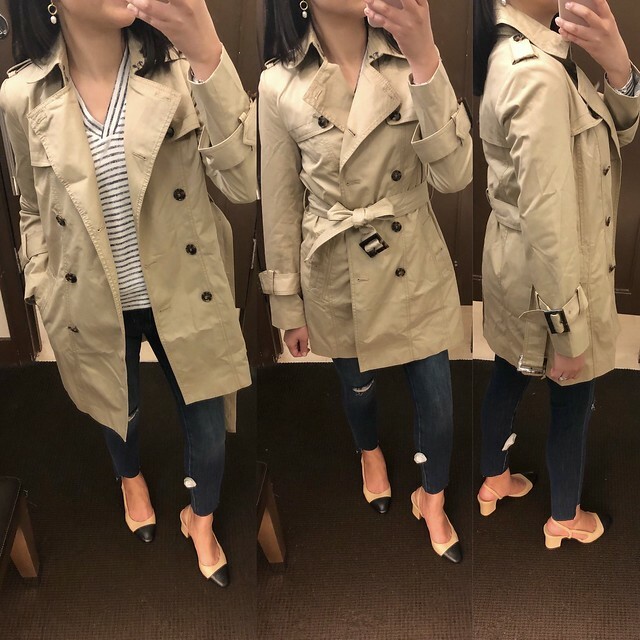 Annie recently shared this trench on her blog which is what prompted me to check out Banana Republic this past weekend. Size XSP has 23″ sleeves. 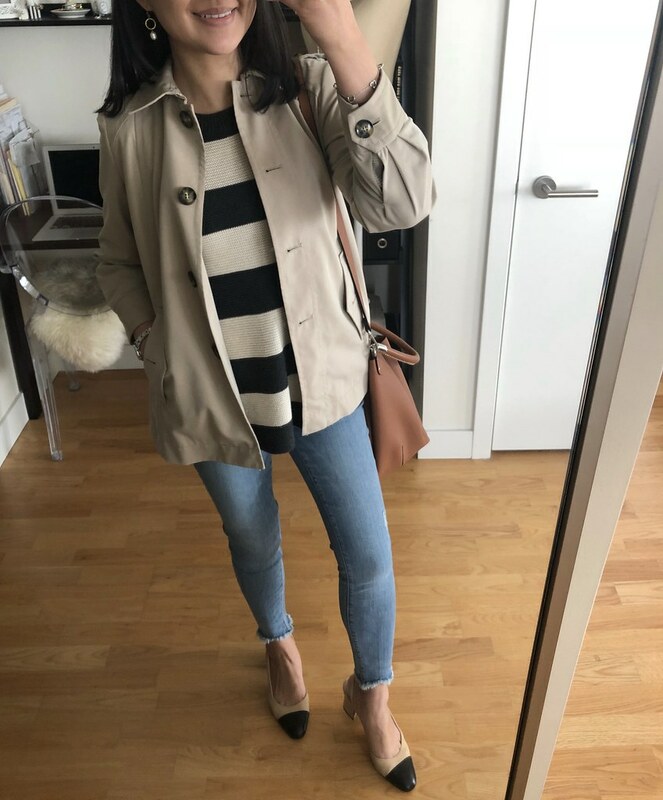 The body of the trench is very generous (it was still too wide when belted) so I would need to try on size XXSP on for sizing. This trench has the cutest mini elephant lining. Thanks so much, Abby. It wouldn't hurt to try on the size down. I really wanted the sleeves to be looser for layering with long sleeves which is why I didn't choose XSP at first.